The tradition of stage magic has a long and wondrous history, dating back to the middle ages, when traveling performers entertained crowds with the famous “cups and balls” routine, or, in its less savory incarnation, “the three shell game“. During the Victorian era, the magic show took its place as a full entertainment, performed in a theatre, with scripted stories, full sets and costumes. Nevil Maskelyne (a clever man who also invented the pay toilet), who performed for years at London’s famous Egyptian Hall, is credited with the idea of presenting a magic performance consisting of short dramatic plays or sketches presented by magicians who were professional actors as well. This innovation gave way to the elaborate traveling magic shows of the later Victorian era. Alas, with the rise of Vaudeville and, later, television variety shows, the magic act over time became more of a carnival type turn or nightclub performance, usually devoid of the grand theatrical manner. Although always popular, magic fell upon hard times as high theatrical art. I must confess here that I am myself an enthusiastic amateur magician, and have been since I was 7 years old. I grew up reading biographies of the great Victorian magicians with their elaborate theatrical performances and have always been disappointed with most contemporary magic acts in the mode of the nightclub entertainment. Until last night. Christian Cagigal, with The Collection, has presented the magic show I dreamed about as a youngster. It is a fantasy come true. 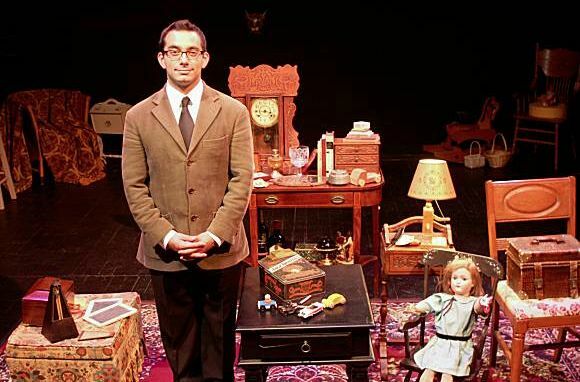 Christian Cagigal presents "The Collection" at The Exit Theatre. Photo credit: Christian Cagigal. Entering the theatre, the audience steps onto a set that might be described as a “cabinet of wonders”. We are in an upscale Victorian parlor, decorated by shelf after shelf of a mysterious collection of oddities. Mr. Cagigal enters as our genial host, dressed nattily but casually, welcoming us to view his collection. He begins charmingly, telling us that “Once upon a time, an audience came to see a magic show…” He moves on to discuss the collection of oddities, telling carefully crafted stories about many of them. The stories are charming in their own right. For some items in his collection, he claims mysterious powers which he proceeds to demonstrate as a means of illustrating the stories. That’s where the magic comes in. Mr. Cagigal required that reviewers agree not to tell the details of what happens, and I will honor that. I will say that the magic is fascinating, puzzling, dramatic, sometimes comic and often downright spooky. The entire evening’s entertainment, which lasts for only about an hour, is quite unlike any magic show you have ever seen and more like a spooky play with astonishing special effects that you will not forget. This very adult magic show would not be suitable for young children (it would certainly go over their heads), but bright older children and teenagers would certainly enjoy it along with the adults, especially if they have ever been bitten by the magic bug. The Collection continues every night through Friday the 13th (that’s April 13th). For further information click here. “The Collection”, a solo magical performance by Christian Cagigal, produced by The Exit Theatre. Posted in Reviews.Tagged Christian Cagigal, cups and balls, egyptian hall, magic, magic show, magic tricks, Nevil Maskelyne, The Exit Theatre, three shell game.